Even in Lutyens' Delhi, there is no more exclusive address than Amrita Shergill Marg. And among the mansions that line this leafy road is one that stands apart from the rest. Created as a colonial house, it was built from scratch by a virtually unknown architect, Sarabjeet Singh, complete with its high corniced ceilings, a quaint English library (that took two years to build) and large gardens dotted with lush palms. Unlike many of its neighbours in that prestigious neighbourhood, it hasn't featured in any design journal yet. But it's one house Delhi can't stop talking about. For 47-year-old Sunil Bharti Mittal, the Ludhiana boy who started out as a bicycle parts dealer and lived in New Delhi's upper middle class Azad Apartments, it has been a long journey to what is ostensibly the city's poshest, largest house. As the country's undisputed telecom czar, he straddles a Rs 8,000-plus crore (Rs 80 billion-plus) empire which, like his house, he built from scratch. But already Mittal is charting a new course. Not content with being telecom's tycoon, he is giving shape to a new thrust in non-telecom businesses. A decade from now, he reckons, telecom may no longer be the largest slice in the Bharti pie. Over the next three months Mittal hopes to float an equity fund with a large corpus (the extent of which is still being decided, though Mittal says money is not a problem), that will be used to fund new businesses in emerging areas, to be run by others. This last is important because it points to the direction -- and role -- Mittal is carving for himself. As the group has limited management time and can't get into too many new businesses on its own, it will fund others instead. "We can invest anything up to 74 per cent, or only 26 per cent, function as an incubator for entrepreneurs with new ideas. . . the scope is endless." This is different from what the group is doing now. 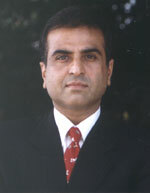 For instance, it has a stake in the Bank of Punjab, "but it is a one-off deal and not structured," Mittal says. For a man who intends to step down as executive chairman of Bharti Televentures -- his telecom empire -- when he turns 50 three years down the line, the push into new initiatives is hardly surprising. Taking his cue from the Tata structure, the new Bharti structure envisages each business being run independently by a CEO with the board looking only at governance issues that cut across companies: group strategy, finance and HR, for instance. Mittal sees himself sliding into a non-executive role by the time he's 49, so he has a year to mentor those occupying the new roles. The new ventures? Mittal is taken with agriculture, and airport infrastructure (he's bid for the privatisation of Delhi airport). And to fund some of it, he's willing to sell part of his family equity in the telecom business, though he doesn't visualise himself as a minority stake holder. But is that the only reason he is calling it quits? Or does he want to relax after a hectic life in business and join politics? He's not giving anything away yet, saying his life, in fact, has become more hectic. He hardly gets to play golf, though he ensures that he keeps fit by jogging four times a week in Lodi Gardens, just a stone's throw away from home. "I have the luxury of stepping down at 50," he says. "Others do it later on, some continue to run. After all, what is Mr Tata doing in his sixties? At one level you can say he is running every business, at another level you can say he is running nothing." Even on politics, he won't let the cat out of the bag yet. "I am not averse to politics," he says, "but neither am I enamoured of it. Whether my public life will meander into politics, I don't know." What he does know is that he will play a larger role in public life (particularly primary education for the underprivileged, and public policy) through the Bharti Foundation -- the corpus for which will soon be hiked considerably: it has already spent over Rs 30 crore (Rs 300 million). Among structures he is studying are those like Ford Foundation and the Rand Corporation to understand the nuances of institution building. Clearly, the Bharti empire is going to look different with each passing year. While he's reluctant to share the percentage of revenues he expects from the non-telecom businesses, it's clear he's looking forward to some hands-on action. "In 1996-97, I used to run Delhi's mobile business personally, though I had CEOs. Today, that has disappeared in a cloud of Airtel circles. I go to my Delhi office once in two-three years. Ten years down the line the telecom business will be what Delhi was 10 years ago." Mittal says it will be one of the many businesses that they would own. His immediate priority is to get the succession plan rolling, and a key ingredient is to delegate more powers to those running the various businesses. For instance, Mittal has two presidents for the telecom operation: mobiles and fixed line. All decisions on operations are taken at the president's office, while 25 per cent of strategy decisions are taken at the corporate office by Mittal and his two joint managing directors (including brother Rajan Mittal). Soon these powers too will be relinquished to the presidents. Already the frequency of management council meetings headed by him are becoming infrequent: once in two weeks currently, and maybe once in four weeks as powers are delegated. Regulatory and procurement decisions have been shifted from the corporate office to the two divisions. Mittal says once he relinquishes executive power, the presidents could move up to become managing directors running the business. Structurally, he refers once again to the Tata operations. "Mr Ramudorai runs TCS independently, and Mr Muthuraman runs Tata Steel, but when it comes to a TCS IPO, it is Ratan Tata and Ishat Hussain (the finance director in Tata Sons) who walk the aisle." Similarly, in Bharti, independent CEOs will run businesses and will relate to either of the joint MDs in the corporate office when it comes to key issues like financing, brand or group strategy. For instance, says Mittal: "If any of them wants to raise resources, they will come to the corporate office as we have the skill sets to raise money at 5.5 per cent in the global market, which they don't have." More importantly, given the structure of Bharti Televentures, he does not see his sons joining the company. What he does envision is consolidation of these two businesses into one in the immediate future -- to be run by a CEO. But there are some attempts at consolidation even here -- for instance, the IT department has been combined, and attempts to consolidate distribution are being made with both companies cross-selling each other's products. Others remain sceptical of what Mittal sees as his renunciation of control at Bharati Televentures. They see the company as a family and close associate run business. "Who do you see at the helm of affairs apart from Sunil? It's only Rajan, or Akhil Gupta, who have been with him from the beginning. The limelight is still on them, so I don't see any cultural changes at all," says one observer. And according to a senior member of the Cellular Operators Association of India who has worked with him for years, "He is too top heavy, so there is duplication of work and tensions, though that might be part of his management style. But I can't think of him really loosening control over his companies." Whether he lets go or not, a telecom managment specialist says, "He is doing the right thing, he is de-risking his business portfolio, especially with the telecom business giving him good cash flows. There is always a risk that a new innovation could throw your telecom business model out of gear, so it not that unusual for him to cash out partly from telecom and de-risk by investing in other businesses." Of the two new businesses, the more ambitious gamble for Mittal will be his foray into agriculture. He says it has the potential of becoming a bigger business than telecom, but warns that it's a tough nut to crack, especially as the company has decided to sell fresh vegetables and not processed foods. The learning curve is underway: the company wanted to send fresh grapes from Sangli, in Maharashtra, to Holland, but they were plagued by a pest attack and delay in shipping. In Punjab, the main challenge is how to ship fresh vegetables from a state where there are no ports or many cold chains. Then there are regulatory issues to be tackled. But for starters, the first model farm is being kicked off in Ludhiana in a few months. Mittal will eventually look into retailing of the group's products by building a franchise chain. In fact, the initial programme was to set up a retail chain before he realised the need to set up the back end first, as fresh products were not available. His other venture arises out of a passion for developing infrastructure for railways and airports. With no hope of the railways being privatised in the next few decades, he's reserved his attention for airports -- since he feels he missed the bus in two other industries that fascinate him. "I like the airline business and the media business, but Naresh Goyal (Jet) and Subhash Chandra (Zee) started at the same time as us and built these businesses. Today they are entrenched, and it doesn't make sense for us to enter there," he says. And so his hope of building world-class airports instead. Mittal reels out reasons why the airport project is close to his heart: it will need $1 billion in investment (and Bharti has proven expertise in putting together large infrastructure projects); over 50 million passengers will use the service (and Bharti understands customer care); and in Changi Airport Authority, Bharti has the best possible partnership. But nothing is final on the airport sector. Says an aviation watcher: "He has a 50:50 chance of getting Delhi. There are others in the race who have political clout and good credentials, so the going won't be easy unless he joins hands with them." Whether he gets the airport project or not, there's no denying Mittal's networking skills. A few weeks ago he was in Cannes attending the GSM Association meet. Says a senior telecom functionary who was with him: "Despite his hectic schedule, he spent four days and gave a a talk on the challenges to get to the next one billion mobile customers. He was the only Indian private sector telecom CEO who spent this kind of time on networking." That is a clear reflection of a winner. Ray Ozzie, the creator of IBM Corp.’s Lotus Notes, is an industry visionary and pioneer in computer-supported cooperative work. On June 15, 2006, Ozzie assumed the title of Microsoft chief software architect previously held by Chairman Bill Gates, and is working side by side with Gates on all technical architecture and product oversight responsibilities in anticipation of Gates’ departure from a day-to-day role in Microsoft in July 2008. At Microsoft, Ozzie previously held the position of chief technical officer from April 2005 until June 2006. Ozzie is the founder of Groove Networks Inc., a leading provider of collaboration software for the virtual office, which Microsoft acquired in April 2005. Before founding Groove Networks in October 1997, Ozzie was the founder and president of Iris Associates Inc. There he created and led the initial development of Lotus Notes. Before Iris, Ozzie was instrumental in the development of Lotus Symphony and Software Arts Inc.’s TK!Solver and VisiCalc, and was involved in early distributed operating systems development at Data General Corp.
Ozzie earned a bachelor’s degree in computer science and has been honored as a distinguished alumnus of the University of Illinois at Urbana-Champaign, where he was first exposed to the nature and significance of collaborative systems and computer-supported cooperative work. This significantly influenced his perspective on collaborative systems and the projects he has undertaken throughout his career. Ozzie is honored as one of seven Windows® Pioneers by Microsoft, was named Person of the Year in 1995 by PC Magazine, and was inducted into the Computer Museum Industry Hall of Fame as well as the InfoWorld Hall of Fame. In November 2000, he received the Institute for Electrical and Electronics Engineers (IEEE) Computer Society’s W. Wallace McDowell Award. He has served as a member of the National Research Council’s Computer Science and Telecommunications Board, and was a member of the NRC committee that produced the landmark CRISIS report on the societal impact of cryptography, a computer security technology. Ozzie is a member of the National Academy of Engineering, and was honored as a World Economic Forum Technology Pioneer in 2001.